Netflix has another dope movie headed your way and this one stars Ant-Man & The Wasp star, Micheal Pena, fighting an alien invasion in Netflix Extinction. Michael Pena is just coming off his scene-stealing return as Luis in the hit Marvel sequel Ant-Man and the Wasp. 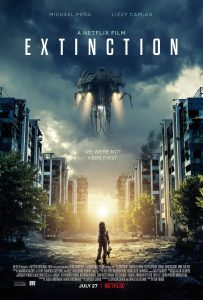 Now, Pena, one of Hollywood’s best actors gets much more dramatic and dark in Extinction. Starring alongside Michael Pena is Lizzy Caplan who was last seen in James Franco’s The Disaster Artist, Luke Cage star Mike Colter, Emma Booth, Tom Riley and Israel Broussard. 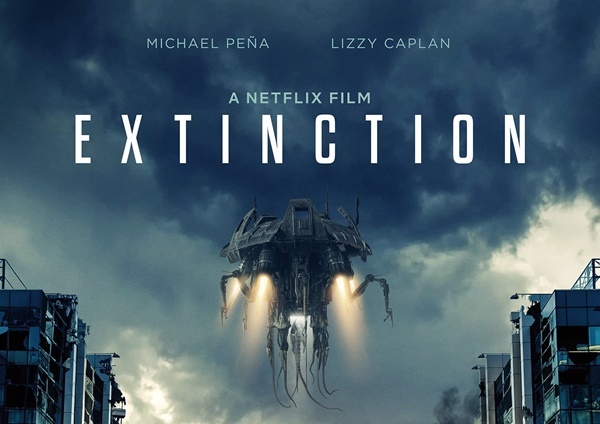 Extinction is just the latest original movie from Netflix. It arrives alongside other big budget releases this summer, only you don’t have to leave the comforts of your couch to get that blockbuster feeling. 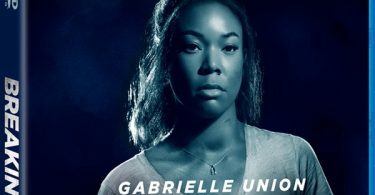 The sci-fi thriller begins streaming July 27, and looks like it might be better than some of the releases coming to your local multiplex during the dog days of this season as it winds up. Ben Young directs Extinction. His directorial debut started with 2016’s Hounds of Love, a film that followed a woman randomly abducted by a disturbed couple, who realizes she must drive her captors apart if she is to survive. 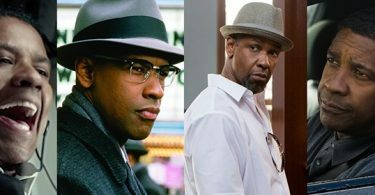 A working-class father has a recurring dream of losing his family. When his unwanted nightmares begin to affect his relationship with his family, he soon realizes they may be the key to a horrible reality. Once the planet is invaded by a force bent on destruction. As the invaders’ assault progresses, he is forced to find both the strength to protect his family and an understanding of who he truly is.